A major conference on genetically modified crops has opened in Germany with calls for Europe to embrace GM food more enthusiastically. Several speakers said GM plants were shown to be safe, predicting Europeans would begin to accept the technology. Not surprisingly, at an event organised by the biotech industry, the calls were greeted with enthusiastic applause. But they must first overcome public mistrust in Europe about the technology and firms behind it. So far, speakers said, there was no evidence that GM food posed any danger to human health. They also said there was no evidence growing GM crops caused environmental harm - a claim which is hotly contested. 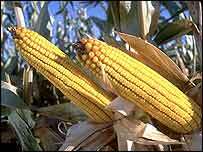 Canada is one country where agricultural biotechnology is widely used. At the conference opening, the Industry and Resources Minister for the Canadian province of Saskatchewan, Eric Cline, said plants with modified genes could provide many other things besides food. "We cannot ignore the potential that ag-biotech research offers," he said. "Whether its greener fuels and fabrics, foods grown without chemicals added to it, more sophisticated drugs and, most importantly, ensuring an adequate food supply for the growing world population." There is a big Canadian presence here because until now this conference has always been held in North America. This is the first time it has come to Europe and that is no accident. The organisers have brought it here now because they believe Europe is opening up for biotech business. Earlier this year, the European Union ended its five-year moratorium on new GM foods. Last week, it approved for the first time a variety of GM seed for planting throughout EU territory. But if European institutions are changing their stance, the question is whether Europe's citizens will follow suit. Industry chiefs here predict they will, but admit it may take some years to overcome public mistrust about the technology itself and the motives of companies behind it.